The dispatch center processed 375 phone calls, receiving 23 911 calls, answered 40 calls for Meeker Police Department (MPD) and placed 91 outgoing phone calls. A total of 155 calls for service were created, 102 for the Sheriff’s Office, 58 for MPD, and seven calls for Meeker Fire and Rescue. (Please note the department breakdown of calls reflects a different number because of incidents with multiple agency response). There were eight auto crashes reported throughout the county, two involving elk or deer. The Sheriff’s Office conducted 38 traffic stops issuing five summons, while MPD had seven stops, issuing seven warnings..
Other calls for the Sheriff’s Office included 21 agency assists, two animal calls, six civil papers served, five business checks, three citizen assists, four motorist assists, three suspicious incidents, two traffic accidents, four VIN inspections and one each: criminal mischief, DUI, traffic complaint and traffic arrest. MPD calls included six agency assist, three 911 hang ups, two alarms, two animal calls, eight business checks, three harassment calls, two juvenile calls, three property calls, four suspicious incidents, three traffic crashes, two traffic complaints and one each: DUI, disturbance, M-1 transport, motorist assist and VIN inspection. There were seven calls for Meeker Fire and Rescue six ambulance calls and one medical transport. 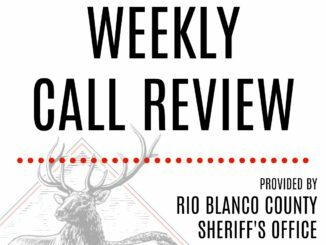 Rio Blanco Detentions facility booked in nine and released nine. One arrested by MPD, two from Rangely Police Department and six by the Sheriff’s Office. Currently housing 10 inmates. There was one inmate transport to or from other facilities.